Bridging the gap between full-size and midsize SUVs, the 2012 Chevrolet Traverse offers seating for up to eight passengers, best-in-class cargo space and a 5,400 pound tow rating. The existing model will receive minor cosmetic enhancements and Chevrolet's new MyLink infotainment system for the 2013 model year. My traverse is a great car for my family! It has out performed my expectations. My 2012 Chevrolet traverse ls is wonderful to drive. 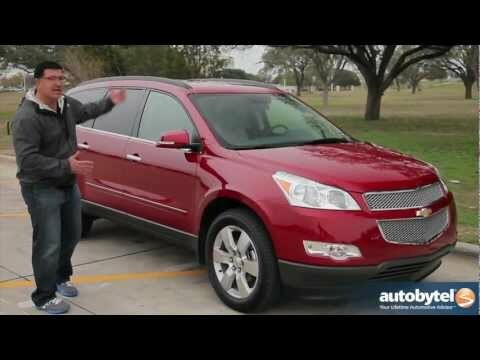 Prior to purchasing this vehicle, I spent about two months researching the traverse. It is rating for overall safety and reliability was 8. 3 from u. S. News and world report's used cars report. The 2012 edition had a excellent reviews for safety, reliability, performance, comfort and interior finishes. It did not disappoint. It can carry seven people comfortably, even on long trips. That fact is important because I have two teenage boys (one of which is six feet tall and still growing) and a husband who is also tall. We have friends that live 7+ hours away so comfort is very important. The acceleration on the 2012 model is incredible. When I need to pass someone on the highway, my 2012 traverse can move! It makes passing a breeze. The ls has fabric seats but unlike other vehicles I have had, it is easy to clean and I do not have issues with water spots. The compartment size when the two rows of seats his huge! I do some landscaping work and I am able to carry 15 bags of mulch with ease. I have been able to carry a newly purchased chest freezer in the traverse's compartment. I love my 2012 Chevrolet traverse ls and will drive it for years to come. Loving this reliable car so great for our family. The vehicle drives smoothly. All wheel drive is the best for all an area that gets all kinds of weather conditions! The car handles well and has great safety features like the screen in the rearview mirror for backing up, side view mirrors with blind spot control are great, seatbelts are comfortable, and lots of space!! The heated seats and automatic start are must haves! I like the Bluetooth capability, AUX cord plug in, child lock windows, bucket seats. It's a very reliable and trustworthy family car! The seats all fold down nicely in the back making it super easy to store all the things we need since we are a family of four and super busy! The anti lock brakes are nice also. Chevy Traverse is built for larger families who love to travel!! Very comfortable driving. Passengers are very comfortable riding in on long trips. Traverse has been a very reliable vehicle and I have not experienced any problems with it. I have the basic package. I thoroughly enjoy the ability to hook my phone up to the Bluetooth speaker. Also, having several places to charge phones and plug in portable DVD players is a plus. I wish they would make the Traverse with built in DVD players. I also wish the backup features would be included in all vehicles along with the parking assist. I love all the storage compartments in the Traverse. I also love that it seats 8.